The island of Maui has a coastline of about 120 miles (193 km). Maui beaches come in all forms and colors – there are gorgeous white sand beaches, black sand beaches and even red sand beaches offering great swimming, snorkeling, surfing, scuba diving, windsurfing and kayaking opportunities. 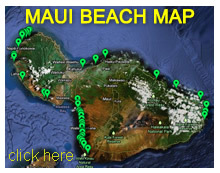 Generally speaking, the beaches on Maui's south and west shore are best for swimming and snorkeling. Beach sand in Hawaii comes in all kinds of shapes and colors. Read more about Hawaiian beach sand composition. Ka'anapali Beach, Napili Bay and Wailea Beach are some of the most popular among visitors, while Ho'okipa Beach is known as one of the world's windsurfing meccas. Then there is Jaws (Pe'ahi), one of the most popular big wave surfing spots, located on Maui's north shore, where waves frequently reach monstrous heights up to 70 feet (21 m) in the winter months.